Wanting to cash in on the success of Lang’s The Big Heat which had been released the previous year, Columbia had the great director re-team Grahame and Ford in another film noir called Human Desire. Personally speaking, I think Renoir’s La Bete Humaine w/ Jean Gabin is a better movie from the same book but it doesn’t have Grahame now does it? In this noir, GG plays her most twisted, depraved, and amoral femme fatale. Vicki Buckley is the wife of Carl (Broderick Crawford) and they have a brutal marriage. Carl is abusive and he lacks any urbanities whatsoever. As we find out from their arguments, it appears that Grahame’s character only married Carl because he had a good job @ the railroad and she had no other outs. It’s a decision she’s come to regret since. 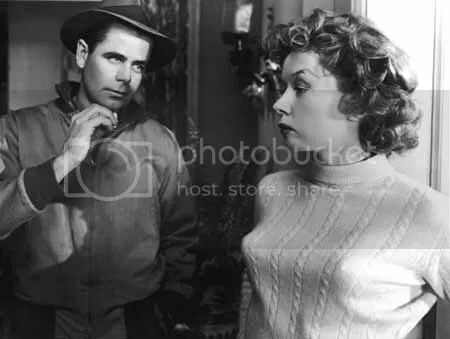 Glenn Ford plays our protagonist in the film, Jeff Warren. Mr. Warren is a Korean War veteran who has come back to his sleepy hometown to re-claim his job as a railroad engineer. Jeff encounters Vicki a couple of times in town and her hotness cannot be denied. He asks around about who she is and he is intrigued by the hushed tones and curt responses he gets from his friends. Crawford’s character screws up @ work by offending a customer and his blustery behavior costs him his job. Desperate and feeling emasculated, Carl pleads with his wife to go see wealthy industrialist Mr. Owens — played by Grandon Rhodes — to make his case and save his position. Mr. Buckley has seemingly bought the story his wife gave him re: how she knows Owens so well. Vicki claims that he is an old family friend that was very fond of her as a child. Is her husband actually asking his wife to bang this guy? Carl dances around any clarification but the implication is clear: do whatever it takes. The whole time Vicki is w/ Owens her spouse is seething in anger and jealousy. Upon her return, she informs him that Owens called in a marker and got him reinstated. His angry interrogation into what happened and what took so long quickly escalates into an ugly fight that gets physical. Vicki begins seeing her new sugar daddy on the side and a suspicious Carl catches them on a train together. Crazed and out of control, Mr. Buckley kills the industrialist right in front of his wife. Surprisingly, Mrs. Buckley is quick to recover and help her husband figure a way out of their mess. Jeff is off-duty and happens to be on the same train bound for Chicago as the Buckleys. Looking to dispose of the body, Carl sees that Ford’s engineer is the only person in the car that would be able to see him pull the murdered industrialist through the door and out of sight. He orders Vicki to go flirt with him as a distraction. Jeff and Grahame’s less-than-reputable housewife hit it off quickly even resulting in a passionate kiss. When the body is found it comes out in the police investigation that the Buckleys were in the train car adjacent to the murder victim. Jeff is called as a witness and reluctantly lies under oath to protect Vicki. He clearly is whipped. They begin a torrid affair and Jeff grows angrier as his lover tells stories and provides evidence of Carl’s mistreatment. Talk snowballs into discussion of murder. The film’s protagonist is so high off Vicki’s fumes that he contemplates ridding her of the brutish Carl. After all, he killed men in Korea. Why would this be harder? I won’t reveal anything more about how Human Desire plays out. What’s left to be said are more thoughts on what makes Vicki tick. Yes, she’s being abused by her husband. But in their scenes together, Mrs. Buckley is no frightened mouse. She’s right in her spouse’s face taunting him and challenging his manhood. The psychology of her character is difficult to grasp. At times she is even what you’d call passive agressive, pushing all the right buttons that will set off the volatile Carl. By the end of the picture, the viewer has to believe that Grahame’s sinister femme fatale is incapable of loving anyone.